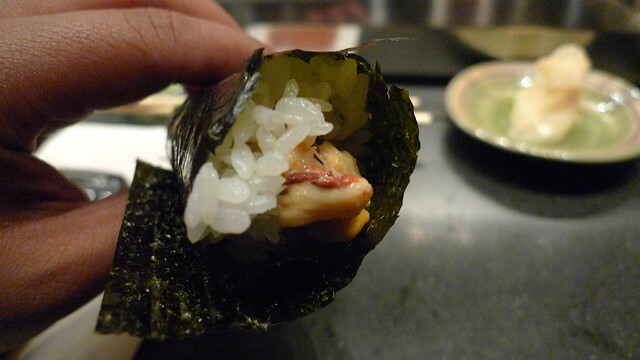 It's not everyday that a Portland restaurant surprises me, particularly within Japanese cuisine. And so my trip to Masu during Portland Cocktail Week 2013 was a revelation. It was a slight change of plans (Paul and I had originally planned on dinner at Le Pigeon), and it turned out to be one of the best meals I've had in a long time in any cuisine. Executive chef Ryan Roadhouse pulled out all the stops during our omakase dinner, and the experience has vaulted Masu among the best I've had anywhere. Enough with the setup, let's get to the meal! 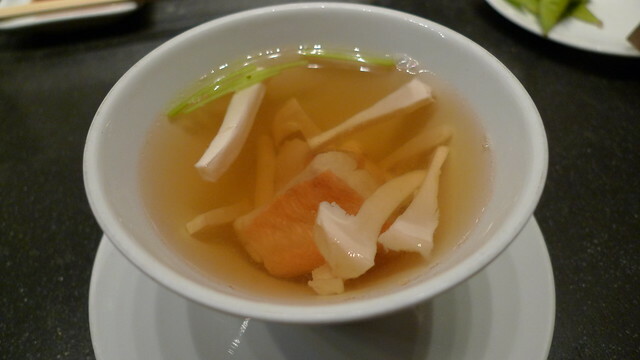 Ryan started us off with a cup of consommé of matsutake mushrooms. It had a deep, savory flavor that I normally find in a chawanmushi so it was quite welcome. A small piece of golden eye snapper provided a nice textural contrast. It was a lovely way to open a meal. 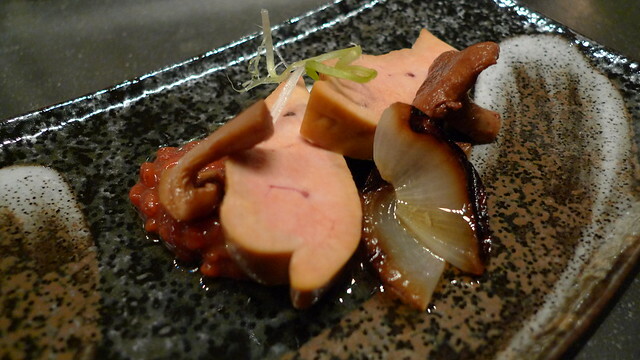 Next we go onto a preparation of ankimo (monkfish liver). Let me say that this is the best preparation of ankimo I've ever had, rivaling that of Ike-san's ankimo from the old Sushi Ike. 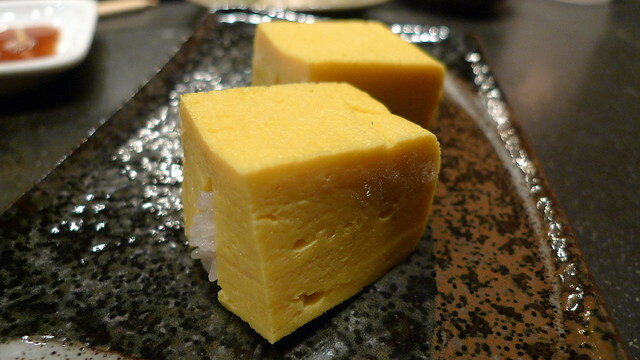 Here at Masu was the first time I'd seen ankimo that wasn't in a pressed or tube form, and it preserved the monkfish liver's foie-like texture. It was served with pickled chanterelles and atop fermented barley. 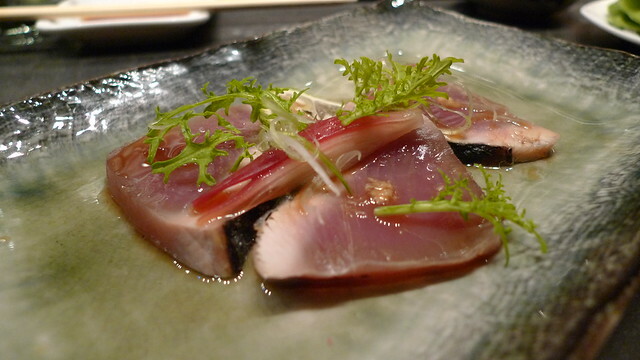 Up next are slices of bonito, seared over burned hay. The usage of hay instead of, say, bincho coals is a subtle one but it was a nice touch, as was the pickled ginger blossom. Remember that consommé at the beginning that was reminiscent of chawanmushi? Well, next Ryan presented us with the real thing. 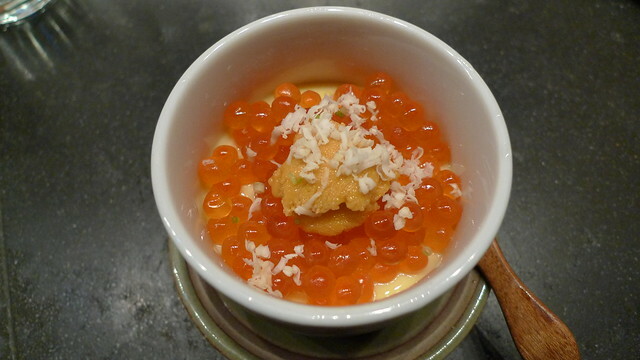 A pillowy egg custard topped with generous helpings of ikura (salmon roe), more of that bangin' sea urchin, and grated with Oregon matsutake. The salmon roe was marinated (which is a trend I've noticed growing among sushi restaurants) in a combination of dashi, mirin, and soy sauce. I basically scarfed this dish down. 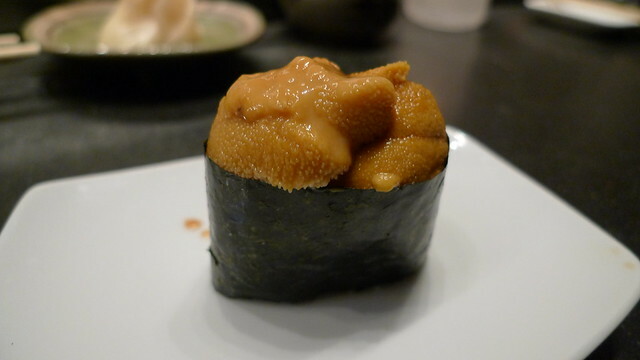 We began to talk about the difficulty of sourcing good sea urchin in Portland since much of it is exported away. Chef Roadhouse described his tenacious effort in securing a source for all his products. Some are local, some are flown in from Tsukiji Market in Japan. And not just seafood; he has a selected brand of everything, including soy sauce and a unique kind of nori for his rolls. Up next was a take on a classic kasuzuke. Here, the generous piece of sablefish (black cod) was cold smoked to give it a flavor reminiscent of something you'd find at Russ & Daughters. But since it's kasuzuke, it was also marinated in sake lees, and so the whole dish was a very cool mashup of Eastern Europe meets Eastern Asia. 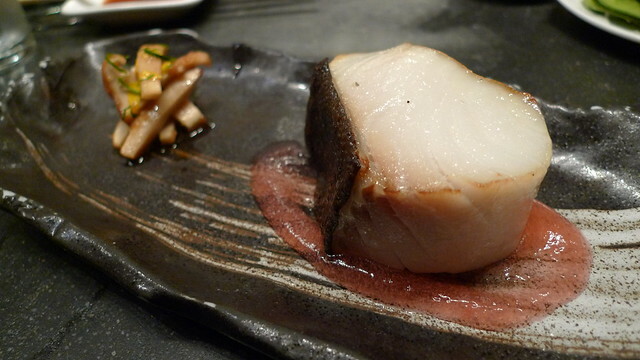 It was served atop a tade-zu, a vinegar sauce made from the Japanese water pepper, and paired with pickled matsutake. When presented the next dish, Chef Roadhouse called it something I'd never heard before: batayaki. Of course, once he described it as geoduck and chanterelle mushrooms sauteed in butter (hence, "bata"), it all made sense. The richness of this dish was a nice turn for the meal, and brought a nice Western nod to an otherwise kaiseki-like meal. From that very Western dish, we now move onto a flavor profile very familiar to me growing up. 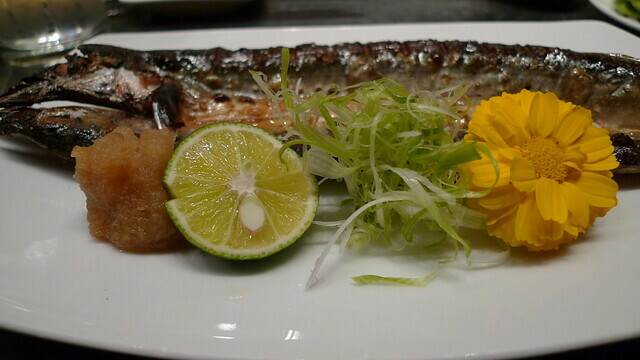 The grilled sanma (pike mackerel) was splayed open and cooked through, served with a wedge of sudachi for acidity and minced radish for bitterness. I quipped how any my Filipino mother would love this dish, if only it were served with a side of steamed rice. It's safe to say that any one of these cooked dishes could serve as the highlight or showcase piece of any omakase meal. The progression had a nice build-up, and the chef showed a great sense of seasonality. I joked that if shabu-shabu showed up, we should strap in for a full 30-course kaiseki experience. Chef Ryan Roadhouse's time stageing at Beverly Hills' Urasawa is evident, as he has a bit of Hiro-san's meticulous attention to detail. 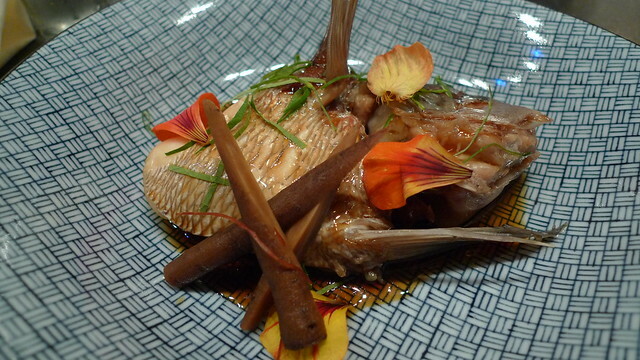 The highlight of the cooked dishes for me as the tai kabuto nitsuke (braised fish head and collar). Red snapper was used here, and the braise liquid had an awesome aroma of fruit and wood. In another revelation of un-conventional pairing, this dish demanded to be paired with a scotch or sherry. Even the humble burdock root offered a nice textural contrast. All in all, this dish was a winner. 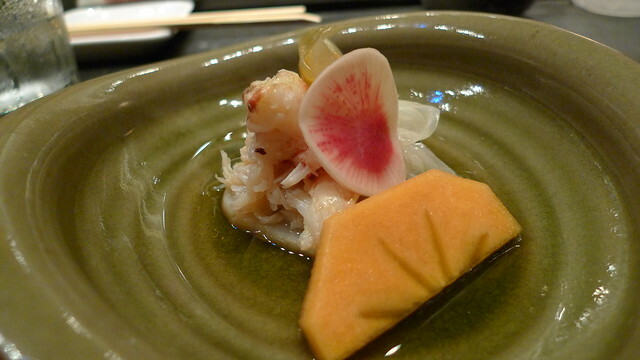 Before heading into the nigiri, we were given a plate of sunomono (pickles) to act as palate cleansers. Dungeness crab was present underneath watermelon radish and other pickles, though there was a lovely mini ravioli made by placing a small bit of that uni in between a delicately folded piece of kelp. It was sublime. Again, Ryan showed the deftest touch. 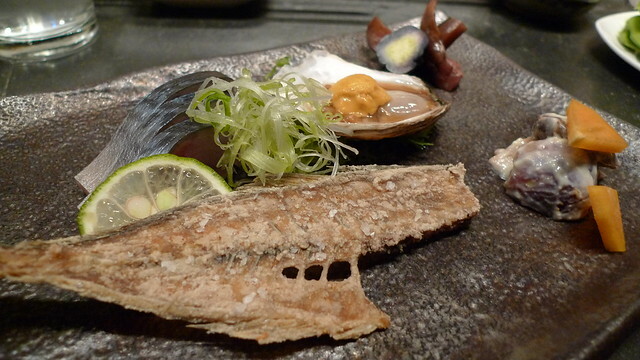 The nigiri kicked off with a duo of flounder. First was a traditional piece of hirame. This is one of my favorite nigiri items, here dressed with a touch of soy sauce (especially flown in from Tsukiji market, of course) and just a touch of sudachi for citrus. It was followed up a not-often-seen piece, engawa. This is the "fin" of the flounder, a slightly tougher cut texturally, but very delightful. 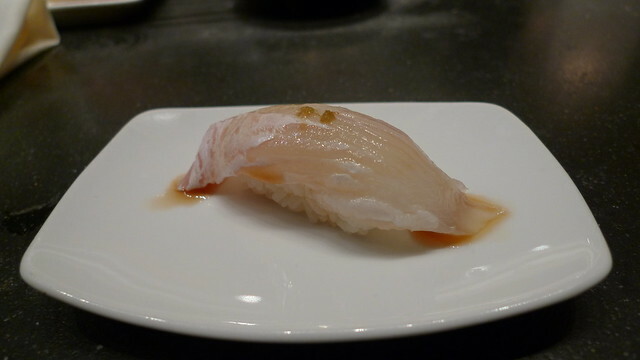 The textural ebb and flow continued with the kanpachi (amberjack). It's one of my favorite white fishes of all, and man was it awesome. It was followed up by a cut of mirugai (geoduck). 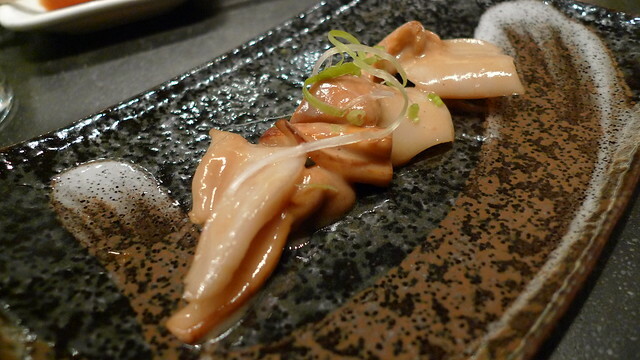 This is a clam I normally dislike in sushi, and whether it's Chef Roadhouse's preparation or his source, this officially became my favorite geoduck dish I've ever had. I'd railed for years at Portland's inability to celebrate its maritime harvest. Restaurants and restaurant-goers eschew seafood (if you remove halibut and salmon from every menu, what would be left?). 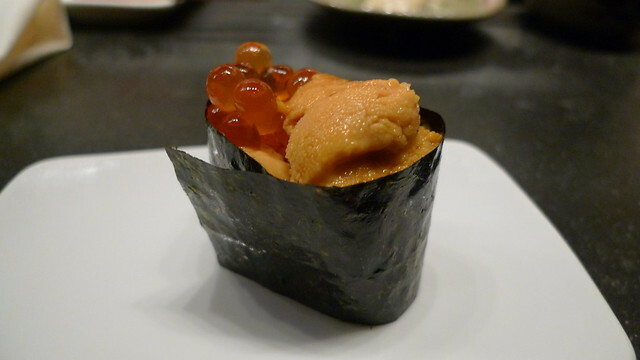 But yet, here at Masu, local sea urchin and local geoduck is used. 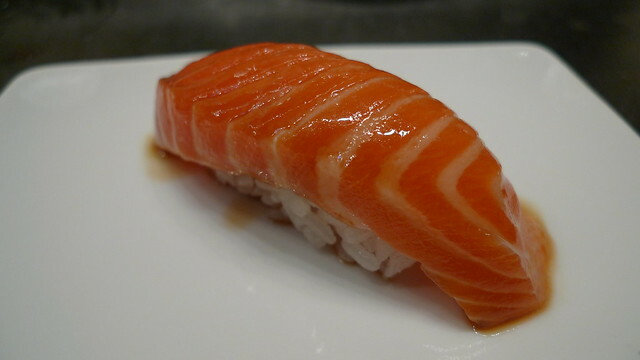 The piece of nigiri above is not salmon, but rather ocean trout. Again, this was a revelation. You have to understand, I've eaten at some of the finest sushi restaurants in the US, and I thought I'd have to start going to Japan to have my mind blown. It's so encouraging to see a young chef, brought up under the proper tutelage, plying his craft with such skill. Ryan Roadhouse is as talented an itamae as there is. And most of Portland has no idea. 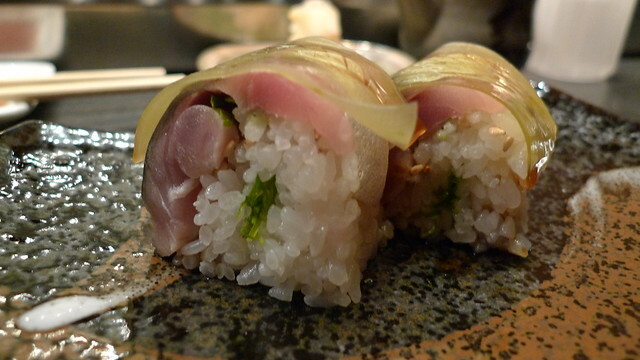 Before I wax poetic about the sea urchin, you'll notice no tuna or toro (fatty tuna belly) here. In fact, Masu does not serve that. Sustainability, yo. I kept saying to Paul all night about how bangin' the uni was. Next up, chef gave us two gunboat rolls in a row with the uni. One was the sea urchin roe by itself, the next was bunched up (two in one!) in the same roll with some more marinated salmon roe. There. are. no. words. These gunkanmaki hit all of my pleasure sensors. Next was a pair of mackerel preparations. 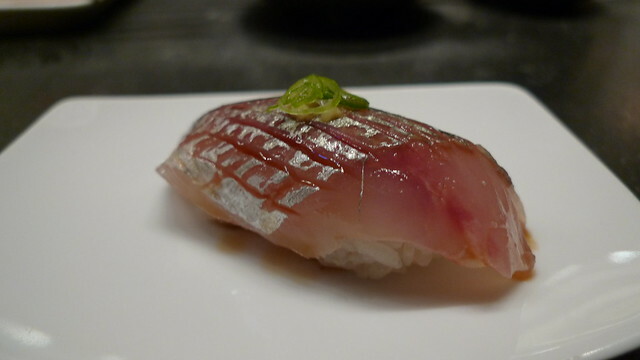 First was a standard piece of aji nigiri (horse mackerel). I'm a big fan of the mackerel family (as well as sardine). 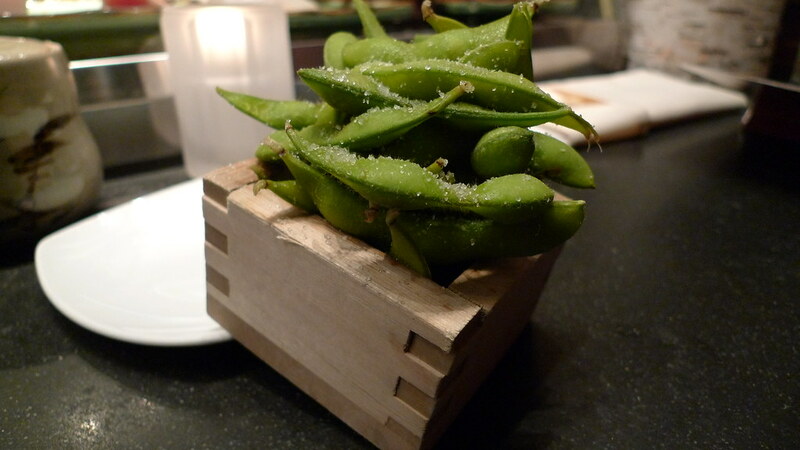 It was followed up by an chef's take on battera (box, or pressed, sushi). Rather than forming the nigiri rice ball by hand and applying the fish, a square box is used to press the rice and fish together. In order not to over-press the rice, the saba is pressed by hand into shape. It allowed the individual flavors to retain their identity, as opposed to more compacted cut roll in which all the flavors tend to muddle together. We closed out the meal just the way I like, with a crab handroll (some more of that uni inside of course) and a piece of egg. I'll wager that Portlanders are unaware of the fantastic talent present right there in city limits. For four years, Chef Ryan Roadhouse has been working to find sources for fantastic ingredients, and exhibiting world class skill. Like Taichi Kitamura in Seattle, it's exciting to see such a young chef doing excellent sushi, and it bodes well for the craft going forward. Masu was a fantastic experience, and I can't wait for my next visit. Chef Ryan Roadhouse of Masu offers some of the best sushi, not only in Portland, but truly anywhere.